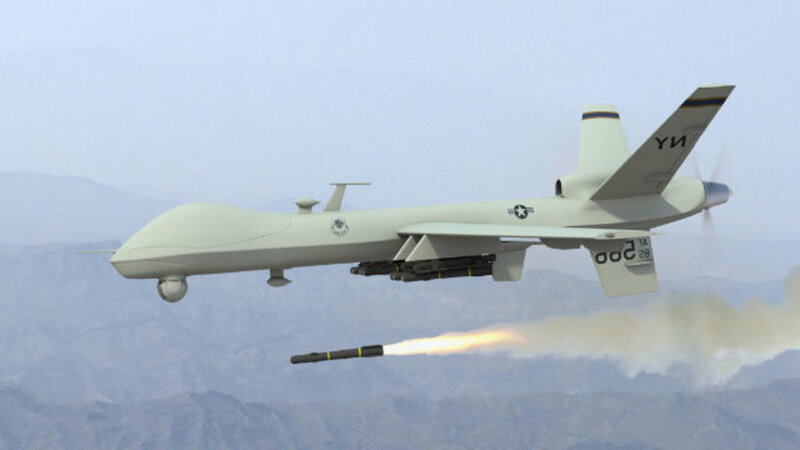 This image shows a US Predator drone firing a missile in Yemen. It is admirable and courageous that many students and others in the USA and around the world want to keep guns out of schools, out of robberies at stores and in home invasions, and out of streets where shootouts often lead to death of innocent civilians, including babies, caught in the crossfire. We also have all of the slaughter by guns and by other means of other species of which many are on endangered species lists or soon to be due to poaching and trophy hunting. This happening is, too, connected to the gun carnage at home in a similar way to the police initiated and other shootings. Then, too, we have the USA warfare across the world. Well, of course the industrial-military complex welcomes it since many of the research labs and companies only have the USA and approved allies as customers. So they need weapons to be used up so as to be able to sell more and make ever greater profits. Who knows about how many millions of children and others around the world have been killed by US guns and other means in the last few decades? And certainly this murderous stance needs to stop, too. If we want to help stop it, antiwar protests are great. Yet the gun reform students and others need to take this matter on as part of their anti-violence campaigns in my opinion. In addition, we need to stop or at least limit buying products from companies that indirectly benefit from the USA warmongering for resources and/or in their attempt to harm other countries like Russia and North Korea, and their allies. Since Alan Greenspan stated his understanding, how many millions more have been killed in Iraq, Syria, Lebanon, Libya, Yemen, assorted African nations and in other lands, too? One can only guess. Aug 20, 2016 – When children are victims, the reality of war comes into sharp focus. If we are totally tired of and outraged by all of the assorted slaughter, if we are tired of fossil fuel pipelines crisscrossing the globe, if we are tired of oil rigs dotting our coastlines, if we are tired of corporate lobbies controlling our politicians … then we must take action and stop buying from the corporations that benefit from our collective thieving ways. We must resist. We must build largely self-sufficient transition towns sdo as to largely avoid our current globalized economic system and its financial arms. Colon, a junior at Worcester State University majoring in criminal justice, is also a member of Temple Emanuel Sinai. He was tapped by the group to open the rally with a religious appeal. Leo Tolstoy asked “How should we live our lives? Please listen to Emanuel Colon give a full and meaningful response to this question. It is very powerful and moving! Supporters gather in Worcester for March for Our Lives protest for gun reform. Emanuel Colon speaks with great passion, unwavering understanding and a resolute sense of conviction. If the whole world of people followed suit, imagine about what a wonderful paradise this world could be for all people, all other species and the planet, itself! So let’s follow his lead, eh? We certainly need more people like him with his strong sense of moral imperative!